‘Spin doctors’ note that topological order, associated with quantum mechanics, also applies to classical material called artificial spin ice. Physicists have identified a new state of matter whose structural order operates by rules more aligned with quantum mechanics than standard thermodynamic theory. In a classical material called artificial spin ice, which in certain phases appears disordered, the material is actually ordered, but in a "topological" form. 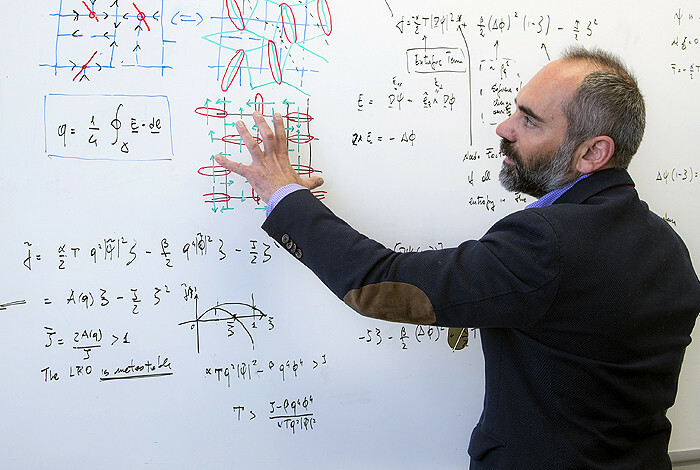 "Our research shows for the first time that classical systems such as artificial spin ice can be designed to demonstrate topological ordered phases, which previously have been found only in quantum conditions," said Los Alamos National Laboratory physicist Cristiano Nisoli, leader of the theoretical group that collaborated with an experimental group at the University of Illinois at Urbana-Champaign, led by Peter Schiffer (now at Yale University). Physicists generally classify the phases of matter as ordered, such as crystal, and disordered, such as gases, and they do so on the basis of the symmetry of such order, Nisoli said. "The demonstration that these topological effects can be designed into an artificial spin ice system opens the door to a wide range of possible new studies," Schiffer said. In the new research, the team explored a particular artificial spin ice geometry, called Shakti spin ice. While these materials are theoretically designed, this time, the discovery of its exotic, out-of-equilibrium properties proceeded from experiments to theory. Performing photoemission electron microscopy characterization at the U.S. Department of Energy's Advanced Light Source at Lawrence Berkeley National Laboratory, Schiffer's team revealed something puzzling: Unlike other artificial spin ices, which could reach their low-energy state as temperature was reduced in successive quenches, Shakti spin ice stubbornly remained at about the same energy level. "The system gets stuck in a way that it cannot rearrange itself, even though a large-scale rearrangement would allow it to fall to a lower energy state," Schiffer said. Clearly, something was being conserved, but nothing appeared as an obvious candidate in a material artificially devised to provide a disordered spin picture. Moving away from a spin picture and concentrating on an emergent description of the excitations of the system, Nisoli described a low-energy state that could be mapped exactly into a celebrated theoretical model, the "dimer cover model," whose topological properties had been recognized before. Then, data from the experiment confirmed topological charge conservation and thus a long lifetime for the excitations. "I find it most intriguing because usually theoretical frameworks move from classical physics to quantum physics. Not so with topological order," Nisoli said. Physical experiments were performed by Schiffer's team at the University of Illinois at Urbana-Champaign and were funded by the U.S. Department of Energy's Office of Science. The kinetics of the material were investigated in real time and real space at the Advanced Light Source. The theoretical work of Nisoli was funded by a Laboratory Directed Research and Development (LDRD) grant from Los Alamos National Laboratory, and the work of Caravelli by LDRD though the Oppenheimer Distinguished Fellowship at Los Alamos.